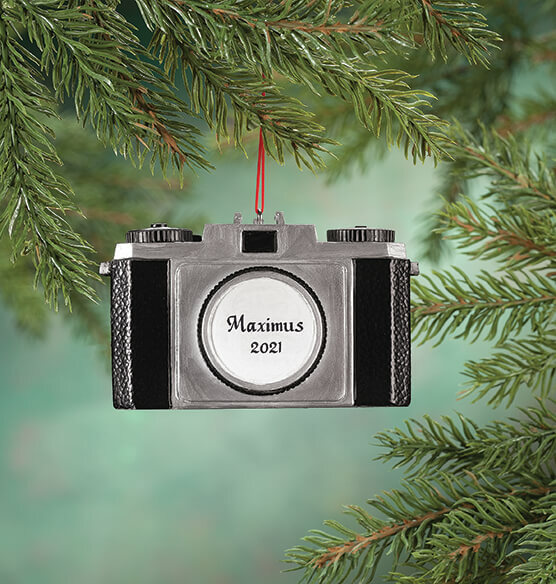 Customized twice for added fun, this personalized camera ornament will showcase one name in front. Creating a one-of-a-kind gift for any shutterbug on your list, the exclusive 3D Christmas ornament promises double the smiles for many holidays to come! Specify name/message; limit 2 lines, 10 letters/spaces each. Resin. 2 1/2" x 3 1/2". Stocking stuffers for photographer daughter. Perfect Gift For the Photography Lover! I try to get or make an ornament for my kids every year. This is perfect for my daughter, who loves photography. The ornament has her name and the year on front, and a photograph of my choice on the back. It's a really cute ornament and will be a great addition to my daughter's collection. I love that it is personalized -- and so easy to personalize. It's great quality for the price. Definitely recommended! It is ok for a picture ornament except that it is too heavy for a small tree. Also, be careful if you are ordering more than one photo in multiple orders. I ordered 4 with one photo and 3 with another to give out as gifts. They had different inscriptions but all came with the same photo. Trying to resolve the issue. it says i can add a picture, i cant see where i can add it or if i can. So im wondering how to if possible? BEST ANSWER: Thank you for your question. The item has changed and we no longer personalize it with a photo. It is just the front. We hope this information will be of help to you. Yes it does. Will you be bringing it back closer to the holiday times or is it gone for good?